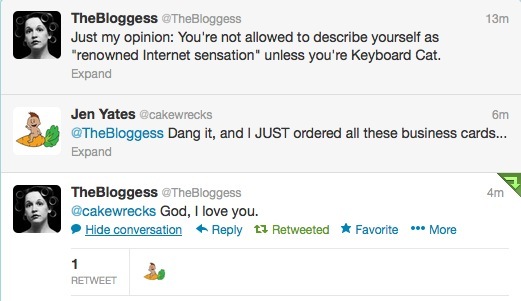 The Bloggess said she loves me, you guys - and possibly called me God. YOUR ARGUMENT IS INVALID. Or something. Gratuitous quotation marks *and* a bonus Monty Python sacking? Bless you, Jordan Kvochick. You should have a trophy wall in your house. It could be full of shout-out print-outs from your Internet Heroes! Shouldn't it be "Renowned" "Internet" "Sensation"? 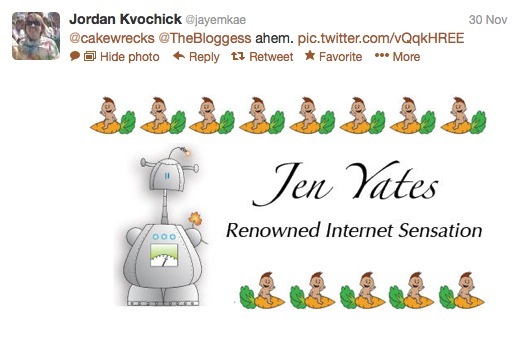 my two favorite internet Jens! HOORAY! I LIKE IT ALOT! You could do a whole series of them, like the Moo cards that come with several to a set. Just think of all the different spellings and entertaining punctuation marks you could have for "Renowned Internet Sensation"
So nice to have a little chuckle in the morning, thanks to Epbot! You should be feeling the love via post views. I sent some geek friends over to your blog to look at your take on the Princess Bride 25th photo. I know it was eons ago, but not all geeks are current, apparently. Can I squee on your behalf? 'Cause that's pretty amazing. Oh please oh please oh please tell me you're going to actually have these business cards printed. Not that they'd be terribly functional (and by "terribly" I mean "at all") but I feel like if I were you I'd have them sitting on my desk in a professional business card holder, trying and failing to look serious. They are truly one of the best things ever. So do you know whatever happened to Allie? I LOVED her blog and miss her! I love the interwebs so very much when I see things like this. I love it! Now you have to have some printed! BTW, do you have any idea how Allie Brosh is? I'd have put the quotation marks just around "sensation", but I guess that is artistic license. or something. Saw the exchange as it happened, and LOVED it...Twitter is my keep me sane addiction, because little moments like this make me happy. I had one today when one of our local celebs favorited my reply to her. 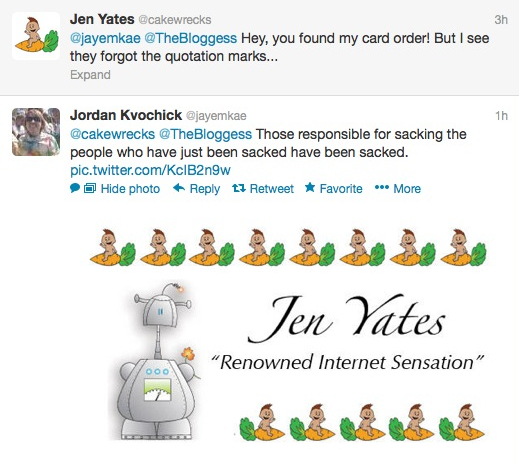 This is just all sorts of awesome-having my two favorite bloggers tweeting each other rawks.